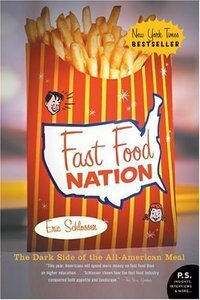 I finished Fast Food Nation this weekend and I cannot recommend it enough. Although it was written 4 years ago, it is still extremely current and relevant to anyone who eats fast food or has a child who eats food from the school cafeteria, which is damn near everyone in this country. Eating too much of this? I thought the book would have a narrow focus just on fast food, but the book does an excellent job of showing how the fast food industry affects so many other aspects of American life and now life in other countries as well, covering everything from health, agriculture, immigration, labor practices, ranching, urban sprawl, politics, and how the meat goes from cow to burger. The slaughterhouse chapter alone may very well turn you into a vegetarian, at least for a week or two. Eric Schlosser does an excellent job of presenting his story in an informative way without being too preachy or succumbing to some of the over the top Michael Moore-esque touches that in the end do not augment one's argument but undermine it. If you're like me and are interested in how things work and how things get done behind the scenes then you will love this book. One cool thing is that California chain In-N-Out Burger actually got serious praise from the author. I didn't eat a lot of fast food to begin with (now that I don't have regular access to Chick-Fil-A) and I eat red meat pretty rarely, but after reading this book I won't be eating either for while. I have already opted out of eating burgers/fries etc a few times since finishing the book; hopefully this will linger longer than a few days or a week. A really interesting read that I cannot recommend enough. Next on my list was going to be Behind The Curtain about soccer in Eastern Europe, but apparently the book is unavailable in the US. Instead I think I'll just read Schlosser's follow up book Reefer Madness, about black markets in the US. I don't think I could tackle this book. I really want to read The Jungle, but am equally scared about that. I don't want to become a vegitarian, but I don't necessarily want to know how my meat is killed either. I may browse it, if I can skip the chapter on the slaugherhouse. What is your fryless record? I can't remember, was it 18 months? I don't believe I have that type of will power.